Simon and Clary act as witnesses to the parabatai ceremony of Emma Carstairs and Julian Blackthorn ... and discuss their own parabatai plans in this precursor to The Dark Artifices. This standalone e-only short story follows the adventures of Simon Lewis, star of the #1 New York Times bestselling series The Mortal Instruments, as he trains to become a Shadowhunter. Tales from the Shadowhunter Academy features characters from Cassandra Clare’s Mortal Instruments, Infernal Devices, and the upcoming Dark Artifices and Last Hours series. 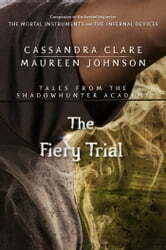 The Fiery Trial is written by Cassandra Clare and Maureen Johnson. This is listed as book #1 but the title says 8 and there's another book listed as #1. Please don't publish this as a review, I'm just using this as a way to report an issue as there's no other obvious way to do so.